Tendering first class facilities away from away from the monotony of city life, Hotel Mirage in Srinagar is magnificently surrounded by the enchanting nature. 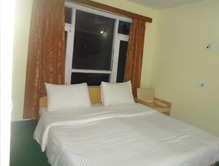 It is situated at Raj Bagh on New Era Road and the visitors by staying in the hotel can get to see various tourist attractions such as the Dal Lake, Hari Parbat Fort, Pahalgam and Royal Springs Golf Course. The décor of the hotel certainly magnetize the visitors and make their holidays memorable. The lush green garden and colorful flowers are very soothing to the eyes and compel the visitors to return on every visit to Srinagar. Accommodation The hotel has 17 well-appointed rooms that are classified into deluxe, super deluxe and suites with mind-blowing views and secluded environment. Each room of the hotel is perfectly designed and exhibits beautiful architectural work. Offering world-class services and facilities, it is a heaven for the visitors to enjoy their holidays in the lap of nature. Round the clock room service, showers, satellite TVservice, free Wi-Fi, private bathroom, ceiling fan, phone are some of the in-room amenities. 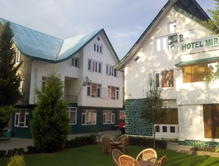 The hotel is popular for its warm hospitality, outstanding service and lip-smacking cuisines, thereby making it a must-visit place for spending the holidays in Srinagar. Dining The restaurant of the hotel offers multi-cuisine delicacies that tantalize the taste buds of the tourists. Each food item is prepared by the well-known chefs who guarantee that delicious food is served to the guests.